Yet most if not all people seek for meaning in life. We are not content with being specks on a random planet in a solar system, part of a vast clockwork universe. To dismiss consciousness as worthless, or merely the play of chance, is to give up on finding real meaning in existence. Freedom Through Love offers possibilities for dealing with some of these big questions, leading to satisfying and convincing conclusions. 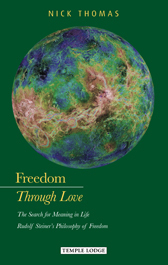 Although based on Rudolf Steiner's Philosophy of Freedom, Nick Thomas does not begin his book with complex philosophical arguments, but with themes that reflect modern times. "Let us not start with abstract questions far from life, but from life itself! ", he states in his opening page. Thus the search for meaning, truth, freedom and love begins with the realities of daily life - people and their relationships - as these constitute the most difficult, but real, issues of contemporary society.